Looking to build a video editing PC on budget for full HD (1080p) and 4k video editing, photo editing and rendering work? If yes then you are at the right place because here I am going to tell on how to build an affordable video editing PC for working with softwares like Adobe Premiere, Corel VideoStudio, Pinnacle Studio, Nero Video etc. Video editing work relies more on CPU cores and its processing power compared to a graphics card. Other major requirement of a video editing PC is decent amount of RAM and fast storage device, preferably a solid state drive (SSD). This budget video editing PC is powerful enough to let you handle or edit videos at 4K resolution. Also this is a great PC for Photo Editing, Graphics and working with photo editing & graphics design softwares like Adobe Photoshop, ACDSee, CorelDRAW, Adobe Lightroom, GIMP, Adobe Photoshop Elements, DxO OpticsPro 11 etc. So, let’s get started with building a budget video editing and photo editing PC for video rendering, video editing and photo editing work. You can also play latest AAA games on this work PC at medium to high graphics settings at 1080p. 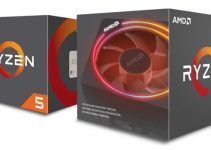 Here are the best budget components that you will need to build an affordable and powerful budget 4K video editing PC for professionals. CPU or Processor is most important part of any computer but it is also the most important component of a video editing PC. This is because video editing requires lot of processing power and greater number of processor cores provides faster & better performance in video editing. Here for this video editing rig, I have chosen Intel Core i5 8600K CPU which is a 14nm hexa-core (6 core) processor in the Intel 8th generation Coffee Lake Processor series. This is a pretty powerful CPU and it comes with base / turbo clock speeds of 3.60 GHz / 4.30 GHz and 9MB cache. This is a K series core processor which means it has got unlocked multipliers and can be overclocked to much higher frequencies using a good liquid CPU cooler and Z370 chipset motherboard for overclocking. The processor is also good for gaming and workstation use because it offers excellent performance for the price. It has TDP of 95W and it comes with Intel UHD Graphics 630 onboard graphics. 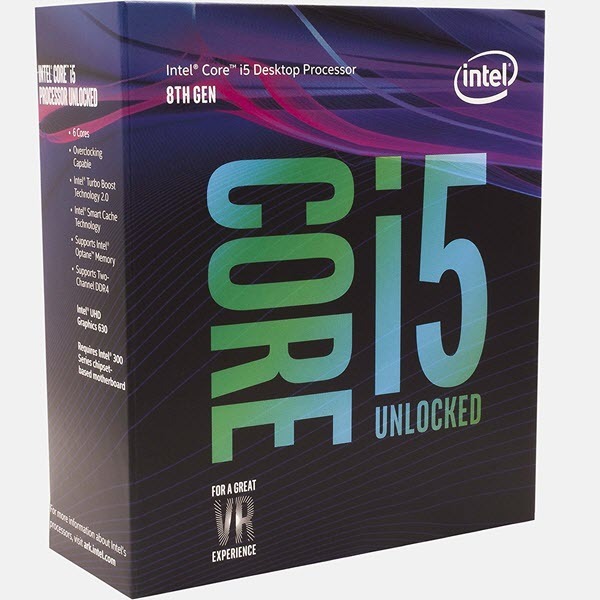 This 8th generation Core i5-8600K processor easily beats previous generation Haswell & Skylake series Core i7 processors. The performance of this processor is higher or equal to that of AMD Ryzen 5 1600X processor which is also a hexa-core processor but it supports 12 Threads at once. You need an aftermarket CPU cooler for K series core processors because they do not come with stock CPU cooler. Here I have selected Cooler Master Hyper T2 which is a compact CPU cooler from Cooler Master and offers good performance on stock speeds. If you want to overclock your CPU then you have to go for a liquid CPU cooler. It supports almost all the latest Intel and AMD Sockets. 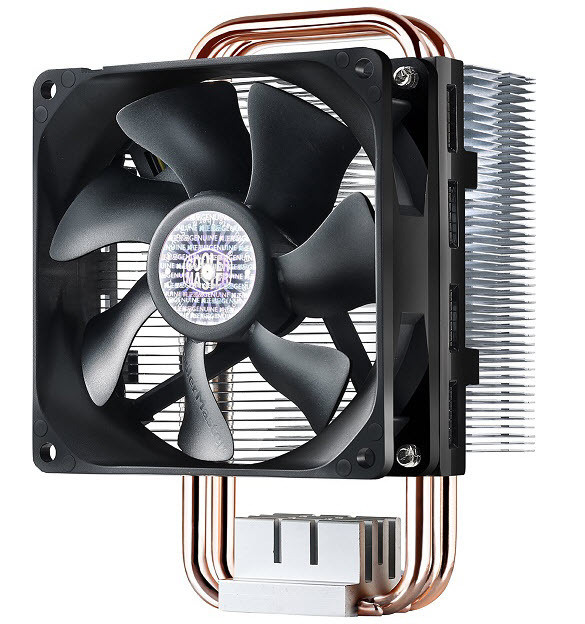 This budget CPU cooler comes with a 92mm fan and two copper heat pipes that have direct contact with the CPU. It can support processors having up to 130W TDP. It comes with all the mounting brackets and is pretty easy to install for both Intel and AMD CPUs. The performance of this compact and budget CPU cooler is great but I would not recommend you to perform overclocking your CPU on this cooler. For overclocking, you should get a good AIO Liquid CPU Cooler, or a powerful CPU Air Cooler. The motherboard I have chosen here is Gigabyte Z370P D3. This is a ATX motherboard based on the latest Z370 Intel chipset and supports 8th generation Coffee Lake processors. 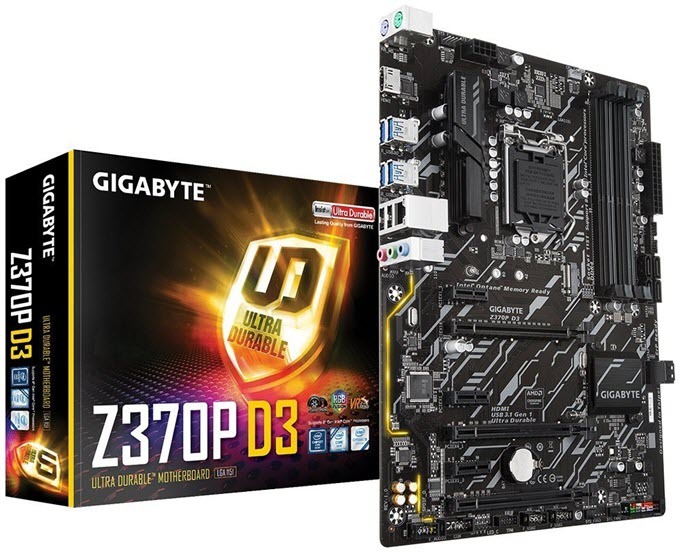 The motherboard supports 64GB DDR4 RAM (up to 4000 MHz) in dual channel mode and has got M.2 slot for connecting super-fast PCIe Gen3 x4 or NVMe SSDs. 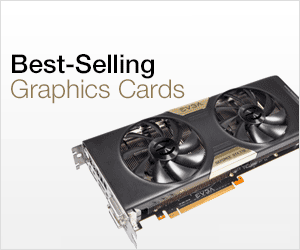 For graphics card, it has PCI-Ex16 slots that supports 2-Way AMD CrossFire multi-GPU setup. Other features include onboard 8 channel audio, gigabit LAN, RGB Fusion for LED Lighting, Intel Optane Memory Ready, high speed USB 3.1 ports, Hybrid Fan headers, UEFI BIOS. The motherboard includes support for Windows 10 64-bit operating system. You need good amount of RAM for video editing work and here I have chosen 16GB of Ballistix Sport LT DDR4 memory. Here I am using two 8GB sticks of this gaming RAM configured in dual channel mode for maximum performance and bandwidth. This is a high performance low profile DDR4 memory that has got clock speed of 2400 MHz (2666 MHz using XMP profile) and comes with a sleek and slim aluminum heatspreader that keeps it cool even during high workloads. You can increase your RAM to up to 32GB by adding two more modules of this DDR4 gaming RAM if you feel that 16GB is falling short for your video editing work. SSD can make a huge performance impact in video editing work compared to a traditional hard drive. For SSD, I have selected Samsung 860 EVO 500GB SSD which is a high performance 2.5-inch SATAIII solid state drive having maximum Read & Write speed of up to 550 MB/s & 520 MB/s respectively. 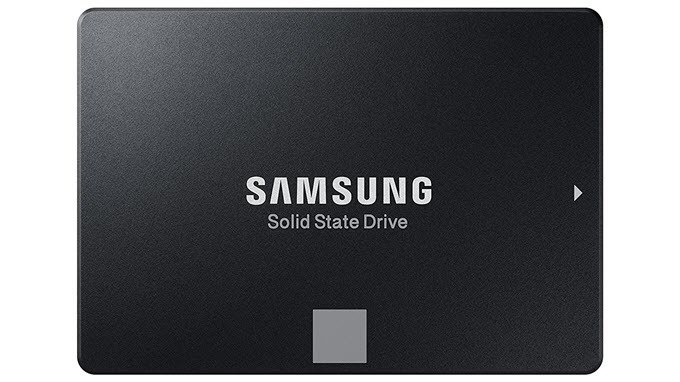 This Samsung SSD has got 1.5 Million Hours Reliability (MTBF) which is pretty good for the SSD in its price range. The SSD uses V-NAND memory chips to store data and supports AES 256-bit hardware-based encryption, and is compliant with TCG Opal and IEEE 1667. This is a great SSD for 4K Video Editing, 4K Video Rendering and working with 3D modelling softwares. For storing all your video files and other files, you do need a high capacity hard drive too because higher capacities SSDs are very expensive. 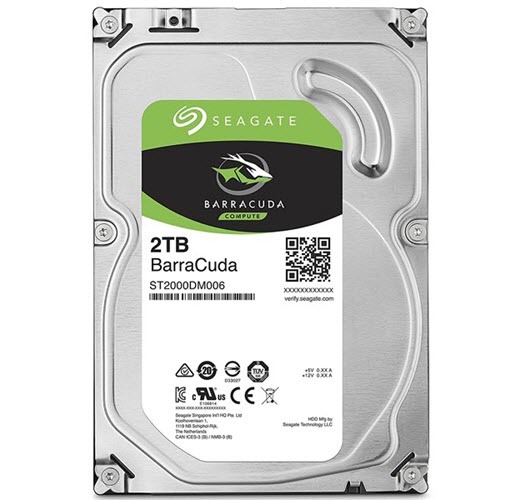 Here I have selected Seagate BarraCuda 2TB which is 7200 RPM 3.5-inch hard drive having SATAIII interface. It comes with 64MB cache and offers tons of storage space for all your video and other work files. Overall, a good inexpensive traditional hard drive that offers good performance for the price. For 4K video editing and rendering you need a decent graphics card because it can really speed things up. Nowadays graphics card is becoming an important component of a video editing PC because all the modern day video editing and photo editing softwares have started taking advantage of GPU Processing power. Here I have picked up ZOTAC GeForce GTX 1050 Ti Mini which is a compact mid-range graphics card based on the Pascal GPU architecture from Nvidia. It comes with 768 CUDA Cores and 4GB GDDR5 memory having 128-bit interface. 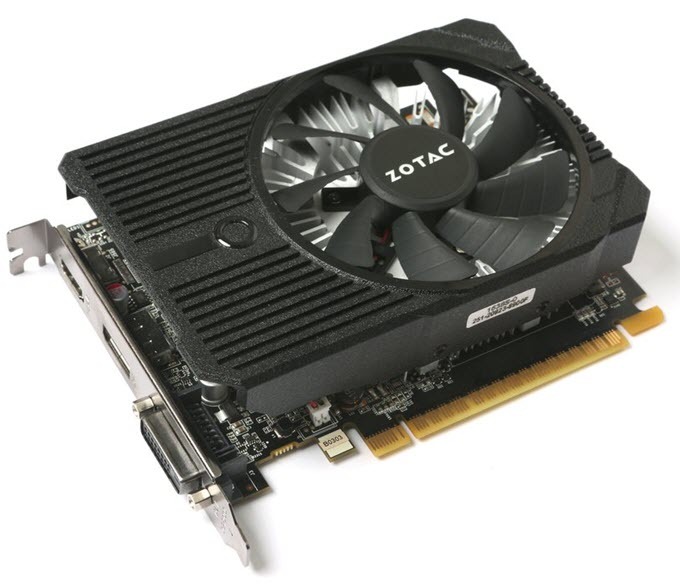 It is a very compact graphics card and can fit in almost all SFF mini-ITX cases. For cooling, it comes with 90mm fan and an aluminum heatsink. The card also has lower power consumption and does not require external power connectors from the PSU. Connectivity options include DVI, HDMI and DisplayPort. Corsair VS550 is a very good budget power supply having maximum wattage of 550 Watts. 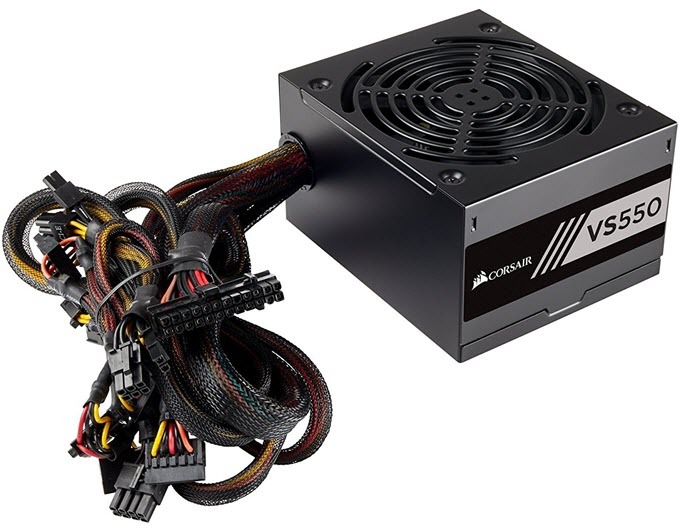 It comes with a single 12V rail having 42A current on it, 120mm silent fan and two PCI-Express 8-Pin (6+2) connectors for graphics card. It is an 80 Plus certified power supply with up to 85% efficiency and comes with all sleeved cables. This 550W power supply is enough to power this video editing PC without any hiccups. Other features include 0.99 Active Power Factor Correction (Active PFC) and all Voltage, Power and Current Protection features i.e. OCP, OVP, OPP, SCP, UVP, OTP. 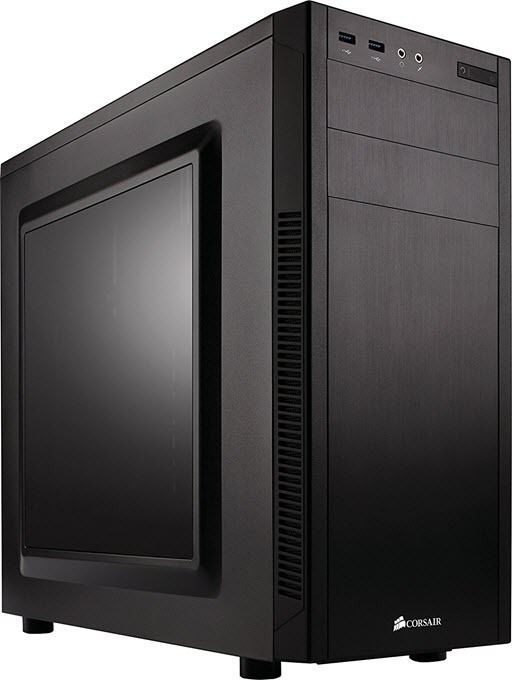 Corsair Carbide Series 100R is an elegant, simple and modern looking mid-tower computer case that is very practical and spacious. It can support up to ATX sized motherboards and for cooling it comes included with one 120mm fan (rear) and offers up to 5 fan mounting locations for installing more case fans for increasing airflow. On the front panel, you will get two USB 3.0 ports and audio jacks. 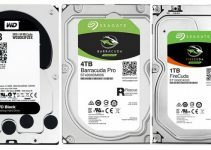 This is a good case for building a budget work PC, office PC or home PC. Below you can find all the specifications and features of this sleek mid-tower case. For monitor, I strongly advise you to get an IPS panel display for video editing work because of its superior color production and image quality. 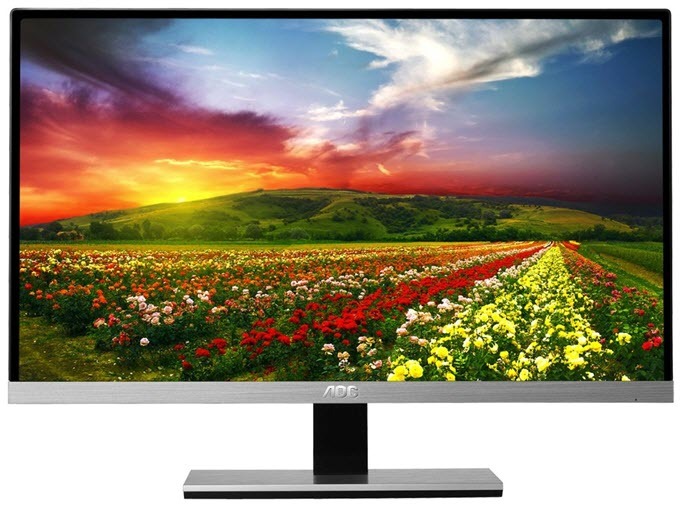 Here I recommend a very good budget IPS panel monitor which is AOC I2367FH 23-inch IPS LED Full HD monitor. This 1080p IPS monitor has got very narrow bezels, a solid stand and 2W internal speakers. It has excellent color production and comes with one VGA and two HDMI ports. You can check out the major specifications of this IPS monitor below. This budget video editing and video rendering PC is powerful enough to edit videos up to 4K and for other professional work. You can also enjoy quite a bit of gaming too on this professional video editing build. If you want to ask anything about video editing build or its components then you can ask me your queries by leaving a comment below. Is workstation GPU not a mandatory when it comes to video editing and possibly 2D design/illustration? Not necessary for video editing or 2D design but if your work involves lot of high-end 3D modelling/design softwares or CAD softwares like Solidworks, AutoCAD etc. then you will get a lot of benefit and performance using a workstation GPU. Noted, and a quick response as well. Thank you, sir. if at all i install hackintosh in this pc, will i be able to run “final cut pro” without much lagging or rendering issue???? Yes it would be able to handle it pretty well. Does the above stated spec practically works as you said for 4k video editing using Adobe premium pro? Btw is it tested? Cause I’m planning to built one for my brother. Downscaling 4k video to 1080p. I don’t want him to feel bad after that’s why. Thats why I’m asking experts suggestions. For 1080p video editing no problems at all, and it still packs enough power for 4K editing too but it can struggle a bit sometimes. Also, get a better cooler than what is mentioned here. 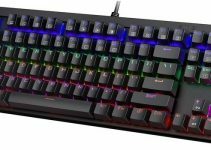 I would suggest Cooler Master Hyper 212 Evo.